Jurgen Klopp is set to enter the most crucial months of his career starting with Tottenham as the Reds prepare for Spurs test. The International Break might have interrupted Liverpool’s momentum but the Reds are determined to continue from where they left. Liverpool are currently at the top of the table two points ahead of rivals Man City with an extra game played but the pressure is on them as Man City have a great opportunity to hit back with their next two fixtures both being against relegation zone teams. Meanwhile, for Tottenham the International Break couldn’t have arrived at a better time. Spurs have struggled all season starting with no transfers, fighting with injury crisis and still somehow managed to be in 3rd position which is an achievement for the team but they have to improve their results soon or face moving down the table as the difference between Spurs and 6th place Chelsea is down to only four points. Liverpool are expected to line up in a 4-3-3 formation while Spurs could line up in 3-5-2 formation. Trent Alexander-Arnold (back), Xherdan Shaqiri (groin) and Naby Keita (knock) are all hopeful of making the match day squad. Joe Gomez (ankle) and Alex Oxlade-Chamberlain (thigh) are back in training but are a couple of weeks away from regaining full fitness. Jurgen Klopp stated in his press conference that this is the first time all players have returned from International duty without any injuries. Maurio Pochettino has some important decisions to make in midfield as both Eric Dier (hip) and Harry Winks (groin) are ruled out with injuries. Serge Aurier face a late fitness test after sustaining a hamstring strain while on International duty. 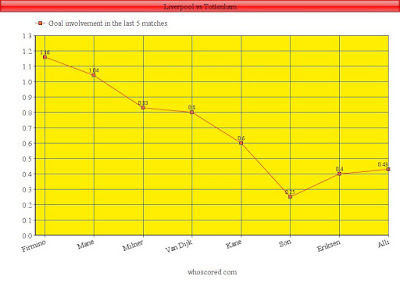 Liverpool and Tottenham have met 53 times in the Premier League with the Reds being victorious on 24 occasions. Spurs have won 14 times and both teams have shared points on 15 outings. The last encounter between the two sides resulted in a 2-1 victory for the Reds with Roberto Firmino scoring the winner before Erik Lamela netting a goal in the closing moments of the game. 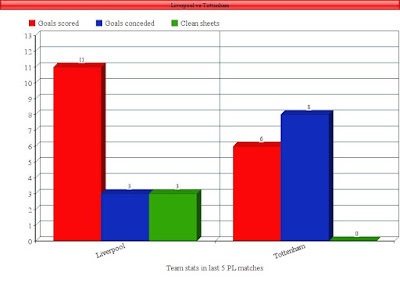 • Liverpool are unbeaten in their last 36 home premier league matches. If they avoid defeat here, it will be the joint-second longest unbeaten home run in the competition’s history (Chelsea 84, Man City 37). • Liverpool have lost just one of their last 24 home Premier League games against Spurs (W15 D8 L1), a 0-2 defeat in May 2011 under Kenny Dalglish. • No player has scored more Premier League goals in 2019 than Liverpool’s Sadio Mane (9, level with Sergio Aguero), with the Senegalese star’s nine goals coming in his last nine games. • Spurs are winless in their last four Premier League games (D1 L3). They last went 5 without a win in the same campaign was back in February-March 2012 under Harry Redknapp. • Spurs have won just one of their last 12 Premier League games against Liverpool (D4 L7), winning 4-1 at Wembley in October 2017. • Tottenham’s Harry Kane has been involved in four goals in four Premier League appearances against Liverpool at Anfield (3 goals, 1 assist). The exclusion of Mo Salah from the graph is due to him not being involved in a single goal in the last 5 games and while he’s not been scoring he has been attracting the defenders attention which has led to opportunities for both Roberto Firmino and Sadio Mane. The inclusion of Virgil van Dijk in this chart should not be a surprise given the season he’s having at Liverpool. For Tottenham, the base of the team Son, Eriken and Alli feed the ball to Harry Kane who does the finishing. Harry Kane has a good record against Liverpool scoring three goals in four games against the Reds. Liverpool have been unbeaten in their last 5 games where they have managed to keep three clean sheets and score 11 goals, while Spurs have conceded more goals than scored and unable to keep a single clean sheet losing to Chelsea, Burnley and Southampton in their last 5 games. Liverpool have the edge going into this clash with the Reds unbeaten in their last 36 Premier League home games and also unbeaten in their last 5 PL games. Meanwhile, the same cannot be said about Spurs who have lost three out of their last 5 games including defeats against Burnley and Southampton. 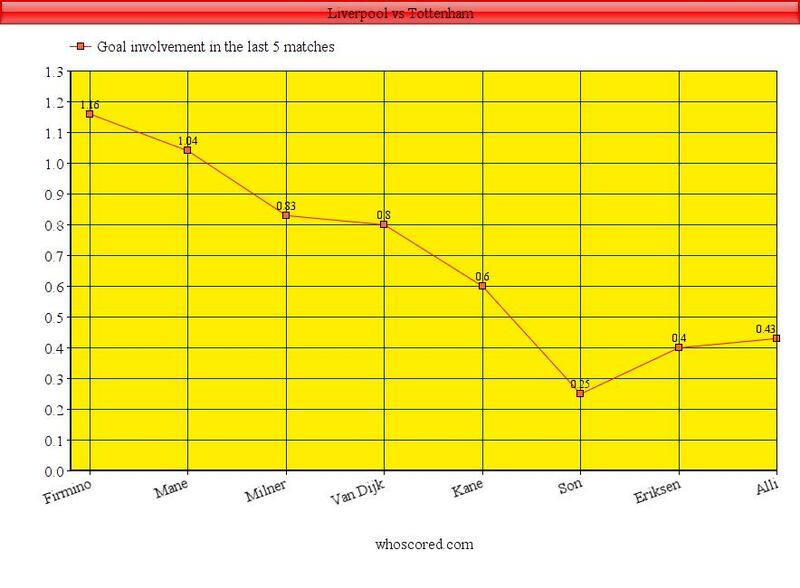 Liverpool have an added advantage as Tottenham are without their key players in midfield, but you can never count out the Spurs who have been consistently finishing in top 4 in the past few years. Overall, this game could play a big role in determining their rest of the season as every game from now on is a final for both sides.